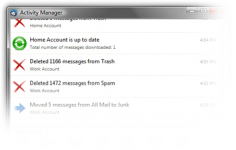 Thunderbird is a powerful email client that allows to manage multiple accounts using a single interface. 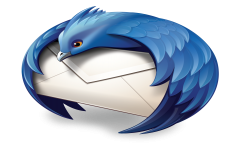 Mozilla Thunderbird is a sophisticated open-source e-mail client. It is lightweight, extremely fast, easy to use and offers many advantages comparing to competing programs. Mozilla Thunderbird consolidates its support for the Twitter API and for a similar display. 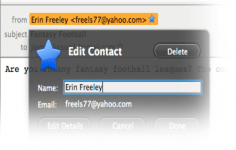 It easily connect to POP3 and IMAP accounts and offers an accessible interface with preview panel and tab (thereby facilitating reading e-mails). Highly configurable, Thunderbird offers the user the possibility to customize the toolbar, add functionality through extensions and apply themes according to his tastes. Thunderbird innovates and sees integrate instant messaging features. The user can indeed connect their Twitter accounts, Facebook, Google Talk, connect to IRC networks as well as moved by the XMPP protocol. ThunderBird allows to manage multiple accounts making it possible to use different accounts with a single interface. Apart from the use of multiple accounts, this tool offers security by encrypting the mail as it includes an optional encryption tool mails. To enhance the security of the mail, Thunderbird has a tool that can automatically detect spam. To do this, the software automatically moves the undesirable letters and places them in another folder.